Since the 1980s, a major change took place in public policies for water resources management. Whereas before governments primarily invested in the development, operation and maintenance of water infrastructure and were mainly concerned with the distribution of water, in the new approach they mainly focus on managing water resources systems by stipulating general frameworks for water allocation. This paper studies the rationales used to justify the water reform process in Kenya and discusses how and to what extent these rationales apply to different groups of water users within Likii catchment in the central part of the country. Adopting a critical institutionalist's perspective, this paper shows how the water resource configurations in the catchment are constituted by the interplay between a normative policy model introduced in a plural institutional context and the disparate infrastructural options available to water users as result of historically produced uneven social relations. We argue that, to progressively redress the colonial legacy, direct investments in infrastructure for marginalized water users and targeting the actual (re)distribution of water to the users might be more effective than focusing exclusively on institutional reforms. Since the 1980s a major change took place in public policies for water resources management. The general objective of policies shifted from an emphasis on physical water delivery by governments to creating an enabling environment for other parties to provide water services. Whereas before governments primarily invested in the development and operation of hydraulic infrastructure and were mainly concerned with the distribution of water, in the new approach they mainly focus on managing water sector by stipulating rules for water allocation (Cleaver and Elson 1995; Allan 1999; Mosse 2004; Lowndes 2005; Saletha and Dinar 2005; Mosse 2006; Swatuk 2008; Ahlers and Zwarteveen 2009; Sehring 2009). Responding to perceived competition over water and inspired by this global shift in the public policy approach, the Kenyan government revised its water legislation in the early 2000s. They took up primarily an oversight role in the water sector in which they attempt to steer and control institutions that govern decision making over water resources by drafting regulatory frameworks, disseminating organizational blueprints and specifying key principles. As such, rather than directly manipulating the distribution of water resources and steering investments in infrastructural development (Ruigu 1988; Ngigi 2002), the Kenyan bureaucrats became involved in crafting an institutional change process in the hope that it would lead to specific material outcomes aligned with their political ideals and ambitions envisioned in the policy reform process (Liniger et al. 2005; Baldwin et al. 2015). The central question we aim to answer in this paper is how does this change in policy approach unfold in practice and how does it affect water resource configurations, here defined as the materialized division in control over, access to, and distribution of water between water users sharing the same water resource? Reforms in public policies are based on a certain logic, a rationale that articulates an assumed ‘common sense’ and which is used to justify the policy intervention. This paper studies the logics used within the ongoing water reform process in Kenya and discusses how, and to what extent, these logics apply for different groups of agricultural water users within a Kenyan waterscape. Based on this, we will show how the current reform process produces inequitable as well as paradoxical outcomes and we will argue that the current partial focus on institutional change processes, ignoring physical aspects such as access to infrastructure and diverse geographical conditions in which water is being used, leads to these specific outcomes. In this way the paper will contribute to the broader discussion on the implications of water reform processes on the management and use of this common pool resource (Cleaver and De Koning 2015). The Likii catchment, located on the slopes of Mount Kenya in the central part of the country, is used as a case study. Under the water reform process that commenced in the late 1990s, nine water user associations (WUAs) have been established and one overarching water resource users association (WRUA) at catchment level. The research focused on the nine WUAs within the catchment as well as the WRUA. The findings presented are based on in-depth semi-structured interviews with thirty-five small-scale farmers and four large-scale water users within the catchment carried out between October 2010 and January 2011. The interviewees were selected by a stratified random selection procedure to guarantee geographical spread and to obtain input from various age, ethnic, class and gender groups. The findings of the interviews were cross checked through focus group discussions, observations, comparison with existing literature and by consultations with other actors such as local authorities, government officials and non-governmental organizations (NGOs) active in the region. This paper first explores the theoretical considerations used to analyze the water reform process. In the next section a detailed narrative of the Likii catchment is provided including a historic analysis of the water resource configurations. Thereafter we describe the 2002 water reform process as stated on paper and how it unfolded within the case study catchment. This is followed by a critical reflection on the logics used to justify the water reform process as well as the implications on control over, access to and distribution of water for various water user groups. In the concluding section we analyze the interplay between geographical conditions, technical options and socio-political arrangements that constituted the water resource configurations in the waterscape and reflect on the implications for policy makers concerned with equity issues and aiming at inclusive development. In this paper we adopt a critical institutionalist’s perspective in which we conceptualize institutions that govern water resources as outcomes of dynamic social processes in which authority is constantly contested, negotiated and reaffirmed (Cleaver and De Koning 2015).1 In the constant reordering of environments, unequal social relations play a central role “in determining how nature is transformed: who exploits resources, under which regimes and with what outcomes for both social fabrics and physical landscapes” (Budds, 2008, 60; see also Leach et al., 1999; O’Reilly et al., 2009). Similarly, Swyngedouw states that “the mobilization of water for different uses in different places is a conflict-ridden process and each techno-social system for organizing the flow and transformation of water (through dams, canals, pipes, and the like) shows how social power is distributed in a given society” (Swyngedouw 2009, 57). In this process not only the agency of social actors plays a role in forming dynamic waterscapes, but also the agency of the physical environment. Ecological relations shape and reshape societies and circumscribe the ever changing range of choices available for human exploitation. Moreover, once constructed, hydraulic infrastructure is not merely a passive object, but a force in itself, capable of rearranging and affecting water flows and as such constitutive of authority as it opens and forecloses certain decisions and future trajectories (Ahlers et al. 2011; Meehan 2014; Van der Kooij et al. 2015). Water resource configurations can therefore be conceptualized as outcomes of a mutually constituted interplay between geographical conditions, available technologies and socio-political arrangements (Mosse 2008; Swyngedouw 2009). Swyngedouw argues that understanding water resource configurations as historically produced rather than based on logic calls for “a transformation in the way in which water policies are thought about, formulated and implemented” (Swyngedouw 2009, 56). To understand the contemporary policy making process, this paper uses an analytical frame that emphasizes the political nature of policies. In this framework policies are regarded as outcomes of a discursive practice of policy making in which problems are framed and ideas, concepts and categories are aggregated through which meaning is given to a particular phenomenon (Hajer 1995; Mollinga 2001; Griggs 2007). Several scholars argue that specific storylines referred to as policy narratives are influential within the policy-making process (Roe 1994; Hajer 1995; Mosse 2004; Rap 2006; Molle 2008; Peck and Theodore 2010). These policy narratives, the discursive form in which a particular logic is presented, can be understood as specific and stabilized interpretations of physical and/or social phenomena that assume certain causal relationships not necessarily grounded in empirical evidence (Roe 1994; Molle 2008). The persistence of policy narratives, even in the absence of empirical grounds, can be seen as the result of the continuous support from actors active within policy networks. These epistemic communities or expert networks gradually get established within the process of the proliferation of a policy in which actors share ideological understandings and cultural practices (Conca 2006; Rap 2006; Molle 2008; Peck and Theodore 2010). Policy narratives form part of the larger theoretical story of how the network understands reality, based on their ideologies and interests, and as such the members of the network have an incentive to maintain particular policy narratives (Mosse 2004; Rap 2006). The policy narratives produce and legitimize certain policy models, a prescribed set of principles, procedures and structures that together provide a ‘blueprint’ for intervention to address a particular issue in different locations (Rap 2006; Molle 2008; Peck and Theodore 2010; Rusca and Schwartz 2012). In this way, a policy model obscures its ideological origin and often becomes disconnected from local realities, possibly producing different outcomes in different contexts. Policy models are widely embraced by governments and development agencies. Policy models fit well with the positivist aims for ‘objectivity’ and ‘neutrality’ that are dominant within the development orthodoxy as it assumes that performance of the standardised policy can be measured and compared based on predefined indicators (Power 2000; Rap 2006; Peck and Theodore 2010). Not only does this ease the work procedures of government agencies; adopting policy models also conveniently depoliticizes the policy making process (Mosse 2004; Molle 2008). Conca argues that policy networks with particular value orientations, through circulation of information, framing problems and solutions, and pressuring governments, have become an “authoritative source of norms in world politics” (Conca 2006, 126; see also Goldman 2007; Peck and Theodore 2010). National governments in the global south are often pressured by these policy networks to conform and adopt similar policy models in order to receive legitimacy and possibly financial support (DiMaggio and Powell 1983; Lodge and Wegrich 2005). It is within this theoretical understanding that we analyze the policies that are propagated within the water sector reforms in Kenya. We acknowledge that policy making is a highly dynamic process and at any point in time several (overlapping) policy networks may exist at different spatial levels (see also Funder and Marani 2015). These policy networks might have different normative views and aim to pursue different interests within the same policy domain and as such compete for authority. After all “... hegemony ... is an always incomplete process. The powers of network-normativity and model-making may be formidable, but they are far from totalizing, since they are also marked by contradiction and contestation” (Peck and Theodore 2010, 171). This contested process may lead to changes in the content of policies as well as to differences in policies at various locations. Nevertheless, within the reform processes ongoing in Kenya we observe striking similarities with narratives used to justify the reform processes elsewhere that lead to the implementation of similar policy models in dissimilar contexts (Cleaver and Elson 1995; Rap 2006; Ahlers and Zwarteveen 2009; Manzungu and Machiridza 2009; Sehring 2009; Kemerink et al. 2011; Mtisi 2011; Manzungu 2012; Van Koppen et al. 2014). It is therefore crucial to scrutinize these narratives and the policy models they promote and legitimize, and to illuminate how they unfold within the historically produced uneven waterscapes such as the Likii river catchment. Likii river catchment is located on the north-western slopes of Mt Kenya within the Upper Ewaso Ngíro North Basin (see also Figure 1). The catchment has an area of 174 km2 with altitudes ranging from about 5000 m above sea level in the upper parts of the catchment to about 2000 m above sea level in the lower part. The upper part has a cool, wet climate with a mean rainfall of 1100 mm/year and is covered by forest, bush land and grassland on deep soils. The lower part has a semi-arid climate with a mean rainfall of 750 mm/year and is covered with savannah vegetation on alluvial soils (Kiteme and Gikonyo 2002; Rural Focus 2009). The catchment has two dry seasons per year, from January to March and September to November, causing low flows in the main Likii River and with some tributaries drying up completely. 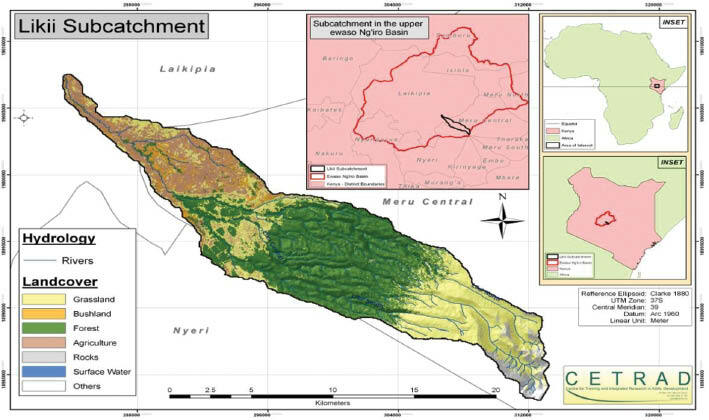 A nested map of Likii catchment with its position in the Upper Ewaso Ngíro North Basin, Kenya and Africa (CETRAD 2010). At the onset of the British colonial administration in Kenya in the early 1900s, white settlers migrated to the country lured by the prospect of land. They settled in the fertile highlands outside Nairobi including the Likii catchment, dispossessing the Maasai and the Kikuyu tribes from their ancestral lands. The farmers abstracted water from Likii River through diversion channels (furrows) and, with government support, they sunk boreholes and constructed dams as supplemental sources of water. Under the Water Ordinance of 1929, and the revision in 1951, most settlers obtained (provisional) water rights for their water abstractions (Nilsson and Nyanchaga 2009). In 1963, Kenya acquired independence and the new government revised the legal structures. In response to this transition most white farmers left the mountain highlands and sold the land to investment companies. These companies sold the land in 0.8 hectare plots to subsistence farmers from the neighbouring Nyeri and Meru districts. Upon dividing the land, the water permits of the white farmers were declared redundant by the Water Apportionment Board and the water rights were therefore obsolete by the time the new water users moved in. Nevertheless, two settlers’ farms within Likii catchment were bought up, including the water rights and hydraulic infrastructure, by companies and turned into commercial flower farms producing for the international market. Currently, circa 60,000 people reside in the Likii catchment with the highest population density in the midlands (Rural Focus 2009). The highlands are part of the Mount Kenya Wildlife Conservancy and form the source of water for the utility supplying water to the nearby towns. The livelihood of the majority of people in Likii river catchment largely depends on small-scale subsistence agriculture, selling part of the harvest in good years, while few people are being employed at the commercial flower farms located in the middle and lower reaches of the catchment. In the lower part of the catchment cattle is herded in addition to subsistence farming. The rainfall variation in the catchment often has a detrimental effect on crop production. As a strategy to cope with uncertainty and poor distribution of rainfall during the cropping seasons, the farmers have constructed furrows to abstract water from the river for supplementary irrigation (Rural Focus 2009; see also Rajabu and Mahoo 2008). The small-scale farmers typically collaborated in the construction and maintenance of the furrows (see for similar examples in Kenya Fleuret 1985, and in Tanzania Kemerink et al. 2009; Komakech et al. 2012a,b). This organization around water was partly an internal process based on the need for collective action to access water and partly assisted by external parties such as NGOs and relief agencies. Not all farmers joined, some farmers had land close to the river so they could easily access water independently while others remained dependent on rainfed agriculture. Since the late 1970s, many water user groups were registered as so-called self-help groups with the Ministry of Culture and Social Services (see also Table 1) and applied for provisional water rights under the Water Ordinance of 1951. These provisional rights would enable these groups to construct the necessary water works, often funded by (foreign) NGOs with labour provided by the farmers. The formal water permit would only be issued after the completion of the works, which included intake structure, 90-day storage reservoir to ensure uninterrupted supply of water during the dry seasons, field canals, and installation of measuring and control devices. In the case-study catchment these constructions resulted in irrigation systems with centralized storage tanks of about 200 m3 from which farmers receive water through a 0.5 inch pipe with a discharge of about 43 m3 per day at full pressure based on design parameters (see also Figure 2). However, the actual discharges are considerably lower; the tanks only store water overnight to be used the next day due to their limited capacity, leading to water shortage during dry spells, and additional pipes have been added after the design of the irrigation systems. Moreover, the discharge differs considerably per irrigation system as in three out of the nine irrigation systems no storage tanks have been installed. The four large scale users in the catchment, the two flower farms, the water utility and the wildlife conservancy, abstract together circa 46% of the total amount of water abstracted from the Likii River (Rural Focus 2004). Details of the nine water user groups established in Likii catchment as well as the large scale water users (source: WRMA archives). Sketch irrigation systems with (left) and without (right) central storage tank. It is within the context described above that the water sector reform process took place through the implementation of the National Water Policy of 1999 followed by the National Water Act in 2002 (Republic of Kenya 1999, 2002). Instigated by a perceived increase in the competition of water (Baldwin et al. 2015), yet similar to water reforms that took place elsewhere in the world since the 1980s, the Kenyan water reform policies no longer emphasize the role of the government to provide water to the citizens, but focus on creating an enabling environment for other parties to provide water. As such the Kenyan government, technically and financially supported by the World Bank and overseas development agencies, reduced its investments in the development, operation and maintenance of water infrastructure and concentrated its efforts on managing water resources (Sambu 2011). Three prevailing narratives can be identified within the official Kenyan policy documents, which resemble the dominant narratives used to justify water reforms in other countries2 (see also Cleaver and Elson 1995; Savenije and Van der Zaag 2002, 2008; Van der Zaag 2005; Conca 2006; Anderson et al. 2008; Molle 2008; Ahlers and Zwarteveen 2009). The first narrative relates to the assumption that lack of entrepreneurship, such as private investments in hydraulic property and commercial use of water, are caused by the absence of, or insecurity in, tenure (Cousins 2007; Molle 2008; Peters 2009). Incorporating this narrative the Kenyan Water Act calls for a revision of the water right regime to provide security in water use for private entities. Building further on the previous legislation, under the Water Act ownership of water exclusively belongs to the State and all uses of water, except for domestic purposes, will be bound by conditional permits (Republic of Kenya 2002, articles 3, 26 and 25; see also Sambu 2011). Permits can be obtained by individuals and legally recognized private entities through administrative procedures that vary based on the amount of water requested. For issuing a permit and determining any conditions to be imposed on a permit, amongst others, the existing lawful uses in the catchment, the efficient use of the water and the strategic importance of the proposed water use are taken into account (Republic of Kenya 2002, article 32). The Act only provides narrow room for using inequity in water allocation as reason for rejecting permit applications ; only in case of changing (environmental) conditions (Republic of Kenya 2002, article 35a) and/or in specific geographical areas (Republic of Kenya 2002, article 36b). The second narrative is based on the hypothesis that centralized decision making leads to decisions that are not sufficiently aligned with the interests and context of actors at local level and that these decisions are therefore not effective. It is assumed that when decision-making is decentralized, local actors have better access to decision-making platforms to participate, monitor and/or use pressure on those involved in decision-making processes. In this way, local actors are believed to have greater influence on decisions that affect them and as such the outcomes would fit better with local realities (Cleaver 1999; Goldin 2013; Kemerink et al. 2013). Based on this rationale the Water Act stipulates the need for public consultation within the application process for water permits (Republic of Kenya 2002, article 107) especially to strengthen the control of water use by private entities (Republic of Kenya 2007). As such, the Water Act effectively sets the stage for the decentralization of water management responsibilities to newly established authorities at lower administrative levels that will facilitate stakeholder participation within new platforms at catchment level as well as formalization of WUAs at local level (see also Kiteme and Gikonyo 2002; K’Akuma 2008; Robinson et al. 2010). The third and last narrative links low prices with wasteful use. It argues that if goods or services come for free or at a low price, users tend to waste it, while if it comes at a higher price they will use it more efficiently (Molle and Berkoff 2007). Within this narrative setting ‘correct’ prices is seen as a tool that facilitates optimal allocation of scarce resources, in this case water, among competing uses and stimulates users to enhance efficient use of the resource (Johansson 2000). Incorporating this narrative the Kenya government introduced the payment of water use charges as part of the Water Act (Republic of Kenya 2002, articles 31 and 60) as tools for demand management and stimulating social and economic use of water (Republic of Kenya 2007, article 105-2c and 2d). The income generated with charging fees for water use is meant to recover the actual costs of “managing the water resources and water catchment areas” (Republic of Kenya 2007, article 105-2a). For each river basin this has resulted in specific tariffs that depend on the available water in the basin, the amount of water requested and the purpose of the water use. According to the Act water used for domestic and subsistence purposes is free of charge. Each of the narratives discussed in the previous section called for particular interventions that together pave the way for rolling out a comprehensive policy model to facilitate the reform process. This section will describe the policy model as has been designed and implemented within the reform process in Kenya. As a central part of the water reforms and under the direct auspices of the Ministry of Water, the Water Resources Management Authority (WRMA) was established at national level with offices at regional and sub-regional (local) level to assist the implementation of the Act. The WRMA has the overall responsibility for the management of the water resources and is in charge of approving water permits applications and charging water use fees. One of the main roles of the WRMA is to ensure stakeholder involvement by initiating and facilitating the establishment and formalization of river resources user associations (WRUAs) at catchment level. According to the Water Act, the WRUAs will advice on issues concerning water resources conservation, the use and apportionment of water in catchment areas and will consist of representatives of the (local) government agencies and representatives of business communities, farmers, pastoralists and NGOs (Republic of Kenya 2002, article 16.3). To protect the interests of the existing water user groups who already shared hydraulic infrastructures, the Water Act introduced WUAs at local level. Within the Water Act the WUAs fall under the definition of “community projects” which are projects authorized by WRMA and operating under a permit to use water or to drain land that is endorsed by at least two-thirds of the persons owning or occupying the particular area (Republic of Kenya 2002, articles 19 and 23). As such the WUAs are legally recognized and regarded as private entities which make WUAs eligible to apply for water permits as well as to be represented in the WRUA at catchment level. Under the 2002 Water Act, the old procedure of granting water permits has been revised in order to better scrutinize the new applications and subject them to wider stakeholder consultations. Permit applications have been classified into categories A, B, C and D for both surface and ground water abstractions depending on the severity of impact the water use activity is perceived to have on the water resources (see Table 2). All permits are issued usually for 5 years after approval at the appropriate level (local, regional and national). A copy of every water permit application should be submitted for comment to the relevant registered WRUA, if one exists, “to ensure that the proposed water use does not affect other users in any way” (Republic of Kenya 2007, 28). The WRUA is expected to recommend the application after inspecting if the water requested is available at the intake and downstream users are not negatively affected. Otherwise the WRUA is expected to consult with the applicant and the water users to agree on modalities of minimizing or mitigating the potential effects of the proposed water use (Kiteme and Gikonyo 2002). After the application is reviewed and approved by the WRMA a provisional permit is given which allows the applicant to start constructing the appropriate water works, including measuring and control devices and a 90-day storage facility, within a certain timeframe. After completion, the works are inspected by the WRMA and if deemed satisfactory the permit is granted. Category system for granting water permits and charging fees as applied in the Upper Ewaso Ngíro North Basin (Republic of Kenya 2007) (exchange rate August 2011: 1000 Ksh=7.50 euro). Once the permit is granted the permit holder needs to pay water fees depending on the amount of water that they abstract (see Table 2). To protect small-scale water users, Category A users with water abstraction of less than 50 m3 per day are not charged any water fees. The tariff setting in category B, C and D is partially progressive for water used for agricultural and commercial purposes: two blocks are defined with 300 m3 per day as the threshold. Under the new laws the water fees also became applicable for existing permit and authorization holders granted under the previous Water Act. In 2001, a process was initiated to establish the overarching Likii water resource users association (WRUA) in line with the legal reforms and in response to perceived imminent conflicts over water between upstream and downstream users (Baldwin et al. 2015). This process was initiated by the Laikipia Research Programme funded by the Swiss Development Cooperation together with one of the large-scale flower farmers who had the capability and resources to mobilize the parties involved (Liniger et al. 2005). The initiators decided that membership of the WRUA was confined to the nine WUAs and the large scale water users i.e. flower farmers, water utility, nature conservation and tourism enterprises. Other users, such as small-scale individual irrigators and pastoralists, were thus excluded beforehand from a voice in the WRUA. The Likii WRUA was registered as an association by the office of the Attorney General in 2002 based on the payment of a registration fee, the WRUA constitution, membership list, and the minutes of election meetings of the office bearers. The content of the constitution has been copied for a large extent from a neighbouring WRUA that was established earlier. The initial mandate of the WRUA was to oversee good water resources management at the river catchment level, including coordinating water abstractions and conflict mitigation. However, the WRUA later expanded its mandate to address issues of water pollution and riparian land degradation, as well as water use efficiency. For water allocations, the Likii River was divided into four sections, each dedicated to serve particular groups of water users (see also Table 3) with specific allocation schedules during rationing periods. Since its establishment, the WRUA plays an important role in monitoring the water abstractions and ensuring that water users stick to their water turns. The large-scale users have self-regulating intake devices, whereas the intakes of the WUAs have been equipped with control valves enclosed in lockable chambers which have three locks, for the WUA, Likii WRUA, and local office of the WRMA respectively. This means that during the opening or closing of the control valve during the rationing periods all three parties need to be present and other parties cannot purposely close the gate valves during the water intake. Subdivision of the Likii river with mean flows, users and initial division of positions within the WRUA management committee including the ratio between positions occupied by representatives from the commercial farmers (c) and representatives from the small-scale farmers (s) (WRMA archives 2011). The positions within the WRUA management committee are also allocated based on the river sections3 and the number of water users they represent (Table 3). It should be noted that the committee members appointed from the Likii North and Likii main river sections include the owners of the two commercial flower farms. The small-scale farmers are indirectly represented in the management committee as five out of the nine chairpersons of the WUAs are member of this committee. The large-scale farmer who initiated the process to establish the WRUA holds the powerful position of secretary and in line with the constitution to ensure impartiality, the first chairperson of the WRUA management committee was an external person. However, the person selected was a commercial farmer from a neighbouring catchment who, according to an interviewee, maintained close relations with the secretary of the WRUA (Interview RL7, 2010). In case of a small-scale user: the water originates from another source than the river (e.g. a spring, borehole or dam). When criteria 3 and 4 are not fulfilled, the permit application will not be recommended to the WRMA. These extra criteria set by the Likii WRUA basically forces small-scale farmers to join the WUAs in case they want to abstract surface water from the river. Only water use rights from springs, dams and boreholes can be acquired on individual basis by small-scale users in contrast to large-scale users, whose individual applications of river abstractions will be considered for recommendation to the WRMA. Even though it was not in the formal policies, the Ministry of Water supported the initiative as according to a Ministry official: “it is easier to administer water rights through groups than dealing with these individual small-scale water users directly” (Interview S5, 2010, see also Funder and Marani 2015). Since the introduction of the required recommendation by the WRUAs in 2007, the Likii WRUA has recommended four abstractions from springs and two from boreholes. In addition, three abstractions from springs were rejected as “they tapped all the water from springs flowing into the Likii River, leaving no flow for downstream use” (Interview RL7, 2010). No applications for abstractions directly from the river have been submitted to the WRUA so far. As part of the reform process the existing collectives of small-scale irrigators in Likii catchment became formally recognized by the WRMA and these WUAs as such as form the main formal bodies in which small-scale farmers are organized. Only through the structure of the WUAs small-scale farmers can be represented within the WRUA, which extended the mandate of WUA management committees as well as their executive powers. As shown in Table 1 the number of members in some WUAs has increased considerably since the establishment while other WUAs remained the same or even decreased in number. In-depth analyses of two upstream and two downstream located WUAs show other significant differences in the management of the WUAs. According to the constitutions, elections are organized every 2 years. However, in two WUAs the office bearers change frequently allegedly as result of incompetence and disinterest in organizational matters, while in other WUAs few changes are made in leadership positions. In one WUA interviewees report that office bearers receive water through 1.0 inch pipes while to the other users the water is supplied through smaller pipes (Interview F29, 2010), a material benefit that potentially explains the reason to cling to power in some WUAs. In another WUA members reported allegations of misappropriation of WUA funds (Interviews S1 and W3L3, 2010). No reservations are made in the constitution on the number of terms that office bearers can be elected, so they can stay in their position as long as they get re-elected. Despite democratic ambitions, kinship and patronage systems seem to determine the appointment of office bearers within the WUAs, with positions circulating within a small group of (rival) local elites. Also the membership fee to join the WUAs varies considerably, ranging from Ksh 29,000 up to Ksh 100,000 per connection.4 In addition members are expected to pay seasonal fees for construction, operation and maintenance of the infrastructure. However, it remains unclear how the incoming money has been spent by the WUAs. By 2011, none of the WUAs had complied with the legislation to construct a 90-day storage facility nor had they enlarged the intake structure and piped system to accommodate the increased number of members. Even though the WUAs did not fulfil the legal criteria to receive the water permit as they did not yet construct the required hydraulic storage infrastructure, the WRMA already granted the permit for three WUAs and is processing the permits for the others. As a result, the WUAs have started paying for the water fees to WRMA as given in Table 2. Although the individual water use of the farmers is below the threshold of 50 m3 per day, which would allow them to abstract for free, their collective water use required them to obtain a permit in category B or in some cases even C.
In this section we will analyze the implications of the water reform process for three groups of water users: the large-scale commercial farmers, the small-scale users who are members of one of the nine WUAs, and the small-scale users who are not member of a WUA. For each group of water users we will validate the three narratives that were used to justify the reform process and reflect on what the selected policy model meant for them including the implications on their access to water. For the large-scale commercial farmers the reforms meant an increase in the price they had to pay for water. To what extent this has affected their business remains unclear, though their modern infrastructure such as self-regulating devices allows them to abstract and store the exact amounts they require and limits the water loss in the system. This gives them the opportunity to find the economic optimum for their agricultural business and the commercial farmers irrigate both during the rainy and dry season with storage capacities up to 160,000 m3. Their privilege of holding water use rights on an individual basis means they have secured access to water and they can apply for renewal or an amendment on the volume of water on their own initiative. Moreover, the reforms allowed the large-scale users to further strengthen their control over the water developments within the Likii catchment. They are individually represented in the WRUA and the large-scale users together occupy a disproportional number of positions in the management committee (Table 3; in other catchments in the same river basin similar imbalances in representation have been documented, see Liniger et al. 2005). This means they can directly influence which water abstraction applications get recommended to the WRMA and which ones do not get recommended. Even though most WUAs already had (provisional) water use rights before the WRUA got established, any application for a permit renewal or an amendment of the abstracted amount of water must be submitted to the WRUA for comment, which to some extent protects the access to water for the large-scale farmers in the longer term. For the large-scale commercial farmers the three narratives that were used to justify the reform process seem to apply (or at least not proven invalid by this research) and the adopted policy model under the water reform process has had an overall positive effect on their (future) access to water. Even though the aim was to increase the water security for small-scale farmers through formalizing existing community organizations into WUAs and recognizing WUAs as private entities eligible for water permit applications, it worked out differently for most members of the nine WUAs in the Likii catchment. The Likii WRUA basically forces all small-scale farmers to join WUAs, which has increased considerably the number of members in six of the nine WUAs. Without sufficient storage in the system and without an amendment of the permit to abstract more water, it means less water is available per person: on average the farmers are currently able to only supplementary irrigate 0.1 hectare during the rainy season. During the dry season only 24% of the interviewed farmers are able to irrigate, mainly those who privately constructed small reservoirs or who have plots located at hydraulically advantageous positions within the system (Munyao 2011). Consequently, most farmers are seriously constrained to enlarge their agricultural production due to the water shortage. Yet at the same time the costs for accessing water have increased considerably: they are obliged to pay water fees in a higher water fee category and in some WUAs they are charged considerable membership fees to get connected. In other words, they pay more for less. In the mean time, underrepresentation in the WRUA and internal struggles driven by personal interests within some of the WUAs leave the members in a vulnerable position to secure access to water. Reflecting on the first narrative used to justify the reform process, we observe that the increased water security did not lead to increased investment as the available amount of water is simply too little to push the agricultural production of the WUA members beyond subsistence level. Moreover, the policy model aimed at increasing the water security for private entities, such as the WUAs, which has been (at least partly) achieved, but which did not translate into an increased water security for the individual small-scale farmers who are member of these associations. For the second narrative we can conclude that, even though small-scale farmers are now officially represented in the decision-making platforms, it did not lead to more effective decisions in terms of safeguarding their interests. The predetermined and biased organizational structure introduced by the policy model has left the WUA members without the necessary voice to participate meaningfully in decision-making processes. As a consequence of the fact that WUA members do not have modern infrastructure to limit loss of water, the payment for water did not lead to more efficient use of water within the irrigation system as was assumed within the third narrative. The small-scale farmers have simply too little control over the water to optimize their water use and maximize productivity. Moreover, the policy resulted in WUA members paying disproportionally more than they ought to pay on an individual basis. The narratives that were used to justify the reform process thus did not materialize for this group of water users; in fact the policy model has had a negative effect on access to water for most WUA members. For those small-scale farmers who are not a member of a WUA their right to water abstractions from the river on an individual basis is virtually removed by the criteria set by the Likii WRUA. Even though it is not a statutory obligation to join a WUA, in reality this is what happens as articulated by one of the small-scale users: “I do not submit an individual permit application because I am afraid that the WRUA will not recommend it and will force me to join the WUA” (Interview F20, 2010). Due to the high costs paid for (access to) water by WUA members and the limited amount of water delivered through the WUA infrastructure it is not attractive for small-scale farmers to join the WUAs. As a result, some of them are forced to remain reliant on rain-fed agriculture for their livelihoods. The WUAs have set up some rules for WUA members to provide water to their unconnected neighbours mainly for domestic purposes. Even though this gives non-WUA members some security in (paid) access to water, it leaves them at the mercy of others: “My neighbour sometimes declines giving me water when in a bad mood” (Interview F32, 2010). Other more fortunate small-scale farmers with riparian access to land resort to pumping. These small-scale abstractions were tolerated under the previous Water Act when most small-scale water users informally fetched water. However, the 2002 Water Act labelled this kind of unlicensed abstraction as illegal. This leads to recurring conflicts with the WRUA and WRMA who try to stop the abstractions during low river flow by confiscating the pumps. This notwithstanding and despite the relative high costs of pumps and fuel, it gives these small-scale irrigators the opportunity to access water based on crop needs, with some farmers irrigating plots of 0.8 hectare both during the dry and rainy season for commercial purposes. This does not only prove that the three narratives used to justify the reform process are invalid for this group of actors, but even destabilizes these narratives as some non-WUA members have increased their agricultural production compared to their neighbours despite decreased security in access to water, without voice in the participatory platforms and without paying water fees. It can be concluded that, even though the adopted policy model has excluded this group of small-scale farmers, it did not necessarily negatively affect access to water for some of them, while others feel inhibited because of the push to join the WUA. This paper shows that the narratives used to justify the reform process can only be upheld for some of the water users in Likii catchment and leaves the majority of the water users in the study catchment with a policy model that marginalizes them. These differential outcomes of the Kenyan water reform process can be partly explained through the interaction between the introduced public policies and the existing institutions at local level. The existing institutions are historically produced, intrinsically plural and unequal, creating different realities for the small-scale subsistence farmers and the foreign large-scale commercial farmers. The ‘roll-back’ of state services from provider to manager and the ‘roll-out’ of specific policy narratives and associated policy model are the products of a global policy network and disseminated to Kenya through the funding mechanisms of the World Bank and other agencies. Central elements of the policy model are securing property rights for private entities, decentralization of decision-making and economization of natural resources use, which are argued to be concurrently operating dimensions through which neoliberal shifts can materialize (Tickell and Peck 2003; Harris 2009; see also Bakker 2007; Ahlers 2010). Operating in an international business environment, these neoliberal inclined normative blueprints are more familiar to commercially oriented large-scale farmers than to the small-scale farmers who thus far have faced a completely different institutional context. This does not only make it easier for the large-scale farmers to adopt the new policies and adjust their practices but also to tweak the rules of the game in such a way that it better serves their interests. Nevertheless, this does not explain the full story as the water reforms also have considerably different outcomes among the small-scale water users who operate within a similar institutional context. To understand this we need to not only look at the plural institutional landscape, but also the diversity in the physical environments in which the actors carry out their daily activities. The commercial flower farms export their products to the European market and can reinvest their profits in innovative irrigation technologies to ensure effective and efficient water use. Moreover, their ability to invest in irrigation infrastructure makes it feasible for them to settle in the drier but less densely populated lowlands, allowing for larger farms with higher economic returns. The small-scale farmers in the midlands have less financial means to invest in hydraulic infrastructure. Whereas their necessity to collaborate was initiated by a physical imperative in terms of the collective action needed to construct and maintain the hand-dug furrows, with time this need has shifted to an administrative imperative; first voluntarily in order to receive funding from NGOs to construct the piped network to distribute the water in the irrigation scheme and now under the water reform process reluctantly to maintain access to, and pay for, water use based on a collective permit. Even though a piped system might lessen the (collective) labour to maintain the system and reduce leakage compared with unlined furrows, the system is less flexible to adjust to the increase of members in response to the reform process. Moreover, the intake structures with control valves protected with three locks might have benefitted downstream users (see also Baldwin et al. 2015), but did little to protect the WUA members from misuse of water within their own network. Especially the decision of the WRMA to grant the WUAs water permits before any storage facilities are in place is questionable: while it has increased the revenue of WRMA, it has weakened the position of the members to demand further infrastructural investments from their leaders. It should be noted that maintaining the requirement of a centralized storage facility for irrigation systems to bridge 90-days dry spells within the new legislation seems not helpful since each WUA has a large command area and thus requires a large and expensive reservoir. Allowing decentralized systems of storage reservoirs would potentially make it a more feasible for the WUAs to fulfil this requirement and would offer more flexibility in terms of water distribution depending on local geographical conditions and cropping patterns (see also Van der Zaag and Gupta 2008; McCartney and Smakhtin 2010). The advantage of flexible technologies or infrastructures for accessing water becomes clear from the narrative of the small-scale irrigators who opt not to be members of the WUA; by pumping the water they can easily adjust their water use to the needs of the crops and the expected return on the investment costs. This allows them to move beyond subsistence farming and more regularly sell part of their harvest on local markets. Paradoxically, only through rejection of the neoliberal inclined water reforms and by opting not to be incorporated in the policy model, these small-scale irrigators manage to actively, and to some extent successfully, participate in the market economy. It should be noted that this is only feasible for farmers who have, for whatever reason, access to a composite set of resources including plots in close proximity to the river. Small-scale farmers who face less advantageous geographical conditions are either forced to join a WUA or, in case they cannot afford membership, are left to the mercy of the rain for their subsistence. This paper shows that the water resource configurations in the Likii catchment are constituted by the interplay between a normative policy model introduced in a plural institutional context as well as the disparate infrastructural options and different agricultural plots available to the various water users within the catchment (see also Swyngedouw 2009). This interplay produces an uneven waterscape that is shaped by historically unequal, yet dynamic, social relations rather than following the simplistic and supposedly universally applicable causal relations assumed within the ‘logics’ articulated within policy narratives. In this process hydraulic infrastructure matters and therefore we argue that perhaps the most effective way of steering water resource configurations is revaluing, at least partly, the importance of physical control over water resources (see also Lankford 2004; Swatuk 2008; Van der Zaag and Bolding 2009; Kemerink et al. 2011; Veldwisch et al. 2013). Policies are always based on (implicit) ideological preferences, whether they focus on infrastructure development or institutional change, and whether they serve the interests of the elites or protect the concerns of the marginalized. Policies will therefore always be contested and prone to manipulation and thus also (plans for) infrastructural development will be influenced by uneven social relations, which may often lead to unintended outcomes. However, the shift in public policies towards primarily steering institutional change processes has given bureaucrats responsible for water resource management fewer means to influence water resource configurations in waterscapes. After all, these targeted investments could potentially open progressive trajectories for water redistribution that otherwise most certainly remain impossible, leaving the small-scale farmers with little chance to increase their water use and to transform their livelihood beyond subsistence. Therefore it is in the interests of governments, especially those concerned with redressing the colonial past, to adopt a comprehensive approach in public policy that encompasses both physical as well as institutional components. After all, history has taught us that resource acquisition by European settlers in Africa did not only thrive as result of beneficial legislations but also as result of massive financial support from colonial authorities to develop hydraulic infrastructure to such extent that even decades after the colonial era “... their rights that are fixed in permanent concrete structures such that the technology itself ... is able to do the work of social differentiation.” (Mosse 2008, 944; see also Manzungu and Machiridza 2009). Direct investments in infrastructure for marginalized water users and targeting the actual (re)distribution of water to the users might be more effective for achieving equity than focusing exclusively on the establishment of ‘inclusive’ ‘participatory’ platforms, setting ‘progressive’ water tariffs or providing ‘security’ in access by granting conditional water use permits without effective monitoring of water use (see also Van Koppen and Schreiner 2014). This also implies that we have to redefine the indicators that are selected to monitor the performance of a policy and include actual water flows and harvested crops. Measuring the number of members WUAs have, the number of women in executive positions, the number of meetings held, the number of administrative permits granted or the amount of water fees paid might be very informative for other purposes but has so far said little about the actual distribution of common pool resources among users. Moreover, actual investments in infrastructural development better justify the payment for water than the “logic” put forward currently and might therefore increase the ability and willingness to pay. Would it only be a matter of time before a policy entrepreneur picks up these insights and spins infrastructure back into the global policy networks or is there really insufficient political will to redress inequity? 1Critical institutionalism is a school of thought that has emerged in critique to neo-institutionalism that has been furthered, amongst others, by Ostrom (1990, 1993). Critical institutionalism has a different view on human agency which results in a different conceptualization of institutions and therefore questions if institutions can be externally designed and locally crafted. Even though Ostrom’s later work shares this more nuanced and complex view on institutions (see for instance Ostrom 2005), she still emphasizes the need for explicit rules and direct incentive systems, which is debated by critical institutionalist scholars. See Cleaver (2012) for a more detailed theoretical discussion on the different schools of thought. 2It should be noted that a fourth policy narrative around allocating water to support essential ecological processes can be identified within the water reform policy documents. According to our knowledge this does not (yet) affect water allocations in the study catchment and as such we will not further discuss this narrative. 3The river sections represent the three upstream tributaries of the river, respectively one on the north side of the catchment, one on the south and one in the middle referred to as central, while the river section referred to as Likii main is the section of the river after the confluence of the three upstream tributaries. 4Based on the exchange rate of August 2011 this equals 220–750 euro. In comparison, the GDP per capita in 2011 has been estimated at 1255 euro (CIA 2012). The work presented in this paper was funded by DGIS, UNESCO-IHE and the Geneva Water Hub. Implementation on site was assisted by WRMA, Ewaso Ngíro North Catchment Area Office. We thank the interviewees for sharing their knowledge and opinions with us. Our special gratitude goes to the chairperson of Likii WRUA for facilitating the research process. Ahlers, R (2010). Fixing and Nixing: The Politics of Water Privatization. Review of Radical Political Economics 42(2): 213–230. http://dx.doi.org/10.1177/0486613410368497. Ahlers, R and Zwarteveen, M (2009). The Water Question in Feminism: Water Control and Gender Inequities in a Neo-liberal Era. Gender, Place and Culture 16(4): 409–426. http://dx.doi.org/10.1080/09663690903003926. Ahlers, R, Cleaver, F, Rusca, M and Schwartz, K (2011). Informal Space in the Urban Waterscape: Disaggregation and Co-Production of Water Services. Water Alternatives 7(1): 154–167. Allan, T (1999). Productive Efficiency and Allocative Efficiency: Why Better Water Management May Not Solve the Problem. Agricultural Water Management 40(1): 71–75. http://dx.doi.org/10.1016/S0378-3774(98)00106-1. Anderson, A, Karar, E and Farolfi, S (2008). Synthesis: IWRM Lessons for Implementation. Water SA 34(6): 665–669. Bakker, K (2007). The ‘Commons’ Versus the ‘Commodity’: Alter-Globalization, Anti-Privatization and the Human Right to Water in the Global South. Antipode 39(3): 430–455. http://dx.doi.org/10.1111/j.1467-8330.2007.00534.x. Baldwin, E, Washington-Ottombre, C, Dell’Angelo, J, Cole, D and Evans, T (2015). Polycentric Governance and Irrigation Reform in Kenya. Governance, [online] http://dx.doi.org/10.1111/gove.12160. Budds, J (2008). Whose Scarcity? The Hydrosocial Cycle and Changing Waterscapes of La Ligua River Basin, Chile In: Contentious Geographies: Environmental Knowledge, Meaning and Scale. Goodman, M. K, Boykoff, M. T and Evered, K. T eds. : 59–78. Aldershot, UK: Ashgate Publishing Limited. CETRAD (Centre for Training and Integrated Research in ASAL Development). CETRAD Online Database, [online] URL: www.cetrad.org. CIA (Central Intelligence Agency). The World Fact book. Washington, DC: CIA. [online] URL: www.cia.gov/library/publications/the-world-fact-book. Cleaver, F and Elson, D (1995). Women and Water Resources: Continued Marginalisation and New Policies. The Gatekeeper Series of International Institute for Environment and Development’s Sustainable Agriculture Programme 49: 3–16. Cleaver, F (1999). Paradoxes of Participation: Questioning Participatory Approaches to Development. Journal of International Development 11: 597–612. http://dx.doi.org/10.1002/(SICI)1099-1328(199906)11:4<597::AID-JID610>3.0.CO;2-Q. Cleaver, F (2012). Development Through Bricolage: Rethinking Institutions for Natural Resource Management. London, UK: Routledge. Cleaver, F and De Koning, J (2015). Furthering Critical Institutionalism. International Journal of the Commons 9(1): 1–18. http://dx.doi.org/10.18352/ijc.605. Conca, K (2006). Expert Networks: The Elusive Quest for Integrated Water Resources Management. Governing Water: Contentious Transnational Politics and Global Institution Building. Conca, K ed. Cambridge, USA: MIT Press, pp. 123–165. Cousins, B (2007). More Than Socially Embedded: The Distinctive Character of ‘Communal Tenure’ Regimes in South Africa and Its Implications for Land Policy. Journal of Agrarian Change 7: 281–315. http://dx.doi.org/10.1111/j.1471-0366.2007.00147.x. DiMaggio, P and Powell, W (1983). The Iron Cage Revisited: Institutional Isomorphism and Collective Rationality in Organizational Fields. American Sociological Review 48(2): 147–160. http://dx.doi.org/10.2307/2095101. Fleuret, P (1985). The social organisation of water control in the Taita hills, Kenya. American Anthropological Association 93(1): 91–114. http://dx.doi.org/10.1525/aa.1991.93.1.02a00050. Funder, M and Marani, M (2015). Local Bureaucrats as Bricoleurs, The Everyday Implementation Practices of County Environment Officers in Rural Kenya. International Journal of the Commons 9(1): 87–106. http://dx.doi.org/10.18352/ijc.526. Goldin, J. A (2013). The Participation Paradigm: Anathema, Praise and Confusion In: Contemporary Water Governance in the Global South: Scarcity, Marketization and Participation. Harris, L. M, Goldin, J. A and Sneddon, C eds. : 199–215. London, UK: Routledge. Goldman, M (2007). How ‘Water for all’ became hegemonic: the power of the World Bank and its transnational policy networks. Geoforum 38: 786–800. http://dx.doi.org/10.1016/j.geoforum.2005.10.008. Griggs, S (2007). Rationale Choice in Public Policy: The Theory in Critical Perspective In: Handbook of Public Policy Analysis, Theory, Politics and Methods. Fischer, F, Miller, G. J and Sidney, M. S eds. : 173–185. London, UK: CRC Press. Taylor & Francis Group. Hajer, M. A (1995). The Politics of Environmental Discourse: Ecological Modernization and the Policy Process. Oxford, UK: Oxford University Press. Harris, L. M (2009). Gender and Emergent Water Governance: Comparative Overview of Neoliberalized Natures and Gender Dimensions of Privatization, Devolution and Marketization. Gender, Place & Culture: A Journal of Feminist Geography 16(4): 387–408. http://dx.doi.org/10.1080/09663690903003918. Johansson, R. C (2000). Pricing Irrigation Water: A Literature Survey. Washington DC, USA: The World Bank.. http://dx.doi.org/10.1596/1813-9450-2449. K’Akuma, O. A (2008). Mainstreaming the Participatory Approach in Water Resource Governance: The 2002 Water Law in Kenya. Development 51: 56–62. http://dx.doi.org/10.1057/palgrave.development.1100457. Kemerink, J. S, Ahlers, R and van der Zaag, P (2009). Assessment of the Potential for Hydro-Solidarity Within Plural Legal Conditions of Traditional Irrigation Systems in Northern Tanzania. Physics and Chemistry of the Earth 34(13–16): 881–889. http://dx.doi.org/10.1016/j.pce.2009.06.012. Kemerink, J. S, Ahlers, R and van der Zaag, P (2011). Contested Water Rights in Post-Apartheid South Africa: The Struggle for Water at Catchment Level. Water SA 37(4): 585–594. http://dx.doi.org/10.4314/wsa.v37i4.16. Kemerink, J. S, Mendez Barrientos, L. E, Ahlers, R, Wester, P and van der Zaag, P (2013). Challenging the Concept of Water User Associations as the Vehicle for Transformation: The Question of Inclusion and Representation in Rural South Africa. Water Policy 15(2): 243–257. http://dx.doi.org/10.2166/wp.2012.127. Kiteme, B and Gikonyo, J (2002). Preventing and Resolving Water Use Conflicts in the Mount Kenya Highland–Lowland System Through Water Users’ Associations. Mountain Research and Development 22(4): 332–337. http://dx.doi.org/10.1659/0276-4741(2002)022[0332:PARWUC]2.0.CO;2. Komakech, H. C, van der Zaag, P, Mul, M. L, Mwakalukwa, T. A and Kemerink, J. S (2012a). Formalization of Water Allocation Systems and Impacts on Local Practices in the Hingilili Sub-Catchment, Tanzania. International Journal of River Basin Management 10(3): 213–227. http://dx.doi.org/10.1080/15715124.2012.664774. Komakech, H. C, van der Zaag, P and van Koppen, B (2012b). Dynamics Between Water Asymmetry, Inequality and Heterogeneity Sustain Canal Institutions in Makanya Catchment, Tanzania. Water Policy 14(5): 800–820. http://dx.doi.org/10.2166/wp.2012.196. Lankford, B (2004). Irrigation Improvement Projects in Tanzania: Scale Impacts and Policy Implications. Water Policy 6: 89–102. Leach, M, Mearns, R and Scoones, I (1999). Environmental Entitlements: Dynamics and Institutions in Community-Based Natural Resource Management. World Development 27(2): 225–247. http://dx.doi.org/10.1016/S0305-750X(98)00141-7. Liniger, H, Gikonyo, J, Kiteme, B and Wiesmann, U (2005). Assessing and managing scarce tropical mountain water resources: The case of Mount Kenya and the semiarid Upper Ewaso Ng’iro Basin. Mountain Research and Development 25(2): 163–173. http://dx.doi.org/10.1659/0276-4741(2005)025[0163:AAMSTM]2.0.CO;2. Lodge, M and Wegrich, K (2005). Control Over Government: Institutional Isomorphism and Governance Dynamics in German Public Administration. Policy Studies Journal 33(11): 213–233. http://dx.doi.org/10.1111/j.1541-0072.2005.00103.x. Lowndes, V (2005). Something Old, Something New, Something Borrowed. Policy Studies 26(3–4): 291–309. http://dx.doi.org/10.1080/01442870500198361. Manzungu, E (2012). The Shifting Sands of Natural Resource Management in Zimbabwe. Special Issue on Natural Resources and Sustainable Development. Journal of Social Development in Africa 27: 7–21. Manzungu, E and Machiridza, R (2009). Economic-Legal Ideology and Water Management in Zimbabwe. Economics, Management and Financial Markets 4(1): 66–102. McCartney, M and Smakhtin, V (2010). Water Storage in an Era of Climate Change: Addressing the Challenge of Increasing Rainfall Variability. Colombo, Sri Lanka: IWMI (International Water Management Institute). Meehan, K. M (2014). Tool-Power: Water Infrastructure as Wellsprings of State Power. Geoforum 57: 215–224. http://dx.doi.org/10.1016/j.geoforum.2013.08.005. Molle, F (2008). Nirvana Concepts, Narratives and Policy Models: Insights from the Water Sector. Water Alternatives 1(1): 131–156. Molle, F and Berkoff, J (2007). Irrigation Water Pricing: The Gap Between Theory and Practice: Comprehensive Assessment of Water Management in Agriculture. Wallingford, UK: CABI.. http://dx.doi.org/10.1079/9781845932923.0000. Mollinga, P (2001). Water and Politics: Levels, Rational Choice and South Indian Canal Irrigation. Futures 33(8–9): 733–752. http://dx.doi.org/10.1016/S0016-3287(01)00016-7. Mosse, D (2004). Is Good Policy Unimplementable? Reflections on the Ethnography of Aid Policy and Practice. Development and Change 35(4): 639–71. http://dx.doi.org/10.1111/j.0012-155X.2004.00374.x. Mosse, D (2006). Collective Action, Common Property and Social Capital in South India: An Anthropological Commentary. Economic Development and Cultural Change 54(3): 695–724. http://dx.doi.org/10.1086/500034. Mosse, D (2008). Epilogue: The Cultural Politics of Water: A Comparative Perspective. Journal of Southern African Studies 34(4): 937–946. http://dx.doi.org/10.1080/03057070802456847. Munyao, S. N (2011). Impact of Formalization of Water Users and Use on Access to Water in Kenya: Case of Likii River Catchment, Upper Ewaso Ngíro North Basin. MSc thesis, Delft, The Netherlands: UNESCO-IHE. Mtisi, S (2011). Water Reforms During the Crisis and Beyond: Understanding policy and political challenges of reforming the water in Zimbabwe. London, UK: Oversees Development Institute, Working Paper No. 333. Ngigi, S. N (2002). Review of Irrigation Development in Kenya In: Changing the face of Irrigation in Kenya: Opportunities for Anticipating Changes in Eastern and Southern Africa. Blank, H. G, Mutero, C. M and Murray-Rust, H eds. Colombo, Sri Lanka: International Water Management Institute. Nilsson, D and Nyanchaga, N. N (2009). East African Water Regimes: The Case for Kenya In: The Evolution of the Law and Politics of Water. : 105–120. Dordrecht, Netherlands: Springer. O’Reilly, K, Halvorson, S, Sultana, F and Laurie, N (2009). Introduction: Global Perspectives on Gender-Water Geographies. Gender, Place and Culture 16(4): 381–385. http://dx.doi.org/10.1080/09663690903003868. Ostrom, E (1990). Governing the Commons: The Evolution of Institutions for Collective Action. New York, USA: Cambridge University Press. http://dx.doi.org/10.1017/CBO9780511807763. Ostrom, E (1993). Design Principles in Long-Enduring Irrigation Institutions. Water Resources Research 29(7): 1907–1912. http://dx.doi.org/10.1029/92WR02991. Ostrom, E (2005). Understanding Institutional Diversity. Princeton, USA: Princeton University Press. Peck, J and Theodore, N (2010). Mobilizing Policy: Models, Methods, and Mutations. Geoforum 41: 169–174. http://dx.doi.org/10.1016/j.geoforum.2010.01.002. Peters, P. E (2009). Challenges in Land Tenure and Land Reform in Africa: Anthropological Contributions. World Development 37(8): 1317–1325. http://dx.doi.org/10.1016/j.worlddev.2008.08.021. Power, M (2000). The Audit Society: Second Thoughts. International Journal of Auditing 4: 111–119. http://dx.doi.org/10.1111/1099-1123.00306. Rajabu, K. R. M and Mahoo, H. F (2008). Challenges of Optimal Implementation of Formal Water Rights Systems for Irrigation in the Great Ruaha River Catchment in Tanzania. Agricultural Water Management 95(9): 1067–1078. http://dx.doi.org/10.1016/j.agwat.2008.04.002. Rap, E (2006). The Success of a Policy Model: Irrigation Management Transfer in Mexico. Journal of Development Studies 42(8): 1301–1324. http://dx.doi.org/10.1080/00220380600930606. Republic of Kenya. Environmental Management and Co-ordination Act. Nairobi, Kenya: Government Printers. Republic of Kenya. The Water Act. Nairobi, Kenya: Government Printers. Republic of Kenya. Water Resources Management Rules. Nairobi, Kenya: Government Printers. Robinson, L. W, Sinclair, J. A and Spaling, H (2010). Traditional Pastoralist Decision-Making Processes: Lessons for Reforms to Water Resources Management in Kenya In: Journal of Environmental Planning and Management 53(7): 847–862. http://dx.doi.org/10.1080/09640568.2010.490051. Roe, E (1994). Narrative Policy Analysis: Theory and Practice. Durham, UK: Duke University Press. http://dx.doi.org/10.1215/9780822381891. Ruigu, G. M (1988). Large-Scale Irrigation Development in Kenya: Past Performances and Future Prospects. Report 23, Nairobi, Kenya: Ministry of Planning and National Development. Rural Focus. Sub-Catchment Management Plan for Likii River Catchment. Nanyuki, Kenya: Water Resources Management Authority. Rusca, M and Schwartz, K (2012). Divergent Sources of Legitimacy: A Case Study of International NGOs in the Water Services Sector in Lilongwe and Maputo. Journal of Southern African Studies 38(3): 681–697. http://dx.doi.org/10.1080/03057070.2012.711106. Saletha, R. M and Dinar, A (2005). Water Institutional Reforms: Theory and Practice. Water Policy 7: 1–19. Sambu, D (2011). Water Reforms in Kenya: A Historical Challenge to Ensure Universal Water Access and Meet the Millennium Development Goals. PhD thesis. USA: University of Oklahoma. Savenije, H. H. G and van der Zaag, P (2002). Water as an Economic Good and Demand Management: Paradigms with Pitfalls. Water International 27(1): 98–104. http://dx.doi.org/10.1080/02508060208686982. Savenije, H. H. G and van der Zaag, P (2008). Integrated Water Resources Management: Concepts and Issues. Physics and Chemistry of the Earth 33(5): 290–297. http://dx.doi.org/10.1016/j.pce.2008.02.003. Swatuk, L. A (2008). A Political Economy of Water in Southern Africa. Water Alternatives 1(1): 24–47. Swyngedouw, E (2009). The Political Economy and Political Ecology of the Hydro-Social Cycle. Journal of Contemporary Water Research and Education 142: 56–60. http://dx.doi.org/10.1111/j.1936-704X.2009.00054.x. Tickell, A and Peck, J (2003). Making Global Rules: Globalization or Neoliberalization? In: Remaking the Global Economy: Economic-Geographical Perspectives. Peck, J and Yeung, H. W. C eds. : 163–181. London, UK: Sage. http://dx.doi.org/10.4135/9781446216767.n10. Van der Kooij, S, Zwarteveen, M and Kuper, M (2015). The Material of the Social: The Mutual Shaping of Institutions by Irrigation Technology and Society in Seguia Khrichfa, Morocco. International Journal of the Commons 9(1): 129–150. http://dx.doi.org/10.18352/ijc.539. Van der Zaag, P (2005). Integrated Water Resources Management: Relevant Concept or Irrelevant Buzzword? A Capacity Building and Research Agenda for Southern Africa. Physics and Chemistry of the Earth 30(11–16): 867–871. http://dx.doi.org/10.1016/j.pce.2005.08.032. Van der Zaag, P and Gupta, J (2008). Scale Issues in the Governance of Water Storage Projects. Water Resources Research 44: W10417. [online] http://dx.doi.org/10.1029/2007WR006364. Van der Zaag, P and Bolding, A (2009). Water Governance in the Pungwe River Basin: Institutional Limits to the Upscaling of Hydraulic Infrastructure In: Transboundary Water Governance in Southern Africa: Examining Unexplored Dimensions. Swatuk, L. A and Wirkus, L eds. : 163–177. Baden-Baden, Germany: Nomos. http://dx.doi.org/10.5771/9783845212890-163. Van Koppen, B and Schreiner, B (2014). Moving Beyond Integrated Water Resource Management: Developmental Water Management in South Africa. International Journal of Water Resources Development, [online] http://dx.doi.org/10.1080/07900627.2014.912111. Van Koppen, B, van der Zaag, P, Manzungu, E and Tapela, B (2014). Roman Water Law in Rural Africa: The Unfinished Business of Colonial Dispossession. Water International 39(1): 49–62. http://dx.doi.org/10.1080/02508060.2013.863636. Veldwisch, G. J, Beekman, W and Bolding, A (2013). Smallholder Irrigators, Water Rights and Investments in Agriculture: Three Cases from Rural Mozambique. Water Alternatives 6(1): 125–141.